Today’s houses of worship look to enhance education and communication for the congregations and the communities they serve by integrating high-performance, automated multimedia systems. We can simplify and enhance the system control with such features as multi-source projection systems and multi-window displays. 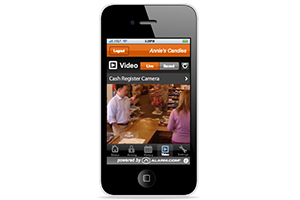 Share messages of worship, missions, philantropy and other activities with advanced audio, video and display systems. 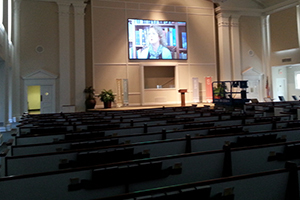 Provide the appropriate atmosphere for congregants to receive these important messages: set the lights, lower window shades, reveal the projector screen, adjust microphone levels, control cameras and distribute content – all with a single touch from a touchpanel, handheld remote or custom keypad. The balance between maintaining traditional worship and introducing modern technology is delicate. Our streamline technology and provide custom interfaces to complement the architecture of the sanctuary without disrupting its atmosphere. Wireless solutions provide the benefits of technology while preserving any historic landmarks. 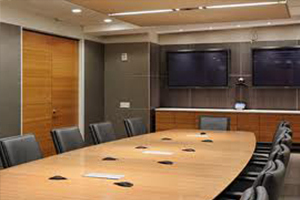 Allow us to provide a solution for your executive boardroom, conference room, training facilities and meeting spaces that drive business. A fully integrated audio/video system allows you to increase the effectiveness and impact of meetings and presentations, whether face to face or in video and audio conferences with clients, vendors and employees anywhere in the world. Innovative audio, video, HD video conferencing & one touch controls (including iPad) make communication and collaboration easy! Brian’s Custom Theaters & Hi-Fi designs and installs affordable restaurant audio and video systems that are easy to operate and will impress and entertain your customers. Our restaurant and bar audio video installation services will take your establishment to the next level and help increase your revenue by keeping your customers ordering food and drinks while watching their favorite sports teams on well-placed video displays. Great audio helps set the tone and atmosphere you want and gives you the ability to create different energies at different times. Control music, lights, mood and energy with programmable restaurant background enhancement systems for single or networked multiple locations. Set volume and lighting levels from the patio all the way to the restrooms. The control system is on a programmed schedule for multiple types of crowds and dining experiences. At lunchtime, multiple restaurants can play the same style of music or playlist. At dinnertime - 5pm; the music, lights, and volume levels all change to a more upbeat tempo. As people fill the restaurant the bar is louder, the music is more upbeat, and the lights come up as the sun goes down. For late night dining, volumes and lights can be programmed to lower again. 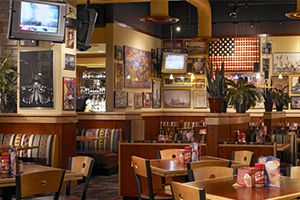 Ask us about programmable restaurant background options for your establishment.